According to modern knowledge, quarks are the most important indivisible building blocks that make up matter. We know of six flavours of quarks: up (u), down (d), strange (s), charm (c), bottom (b) and top (t); each flavour also has its own antimatter counterpart (often marked with a dash above the letter, read as “bar”). Quarks generally are formed in quark-antiquark pairs. They are extremely sociable particles: almost immediately after coming into being, they bind into hadrons, or groups of two, three, and sometimes more quarks or antiquarks, bonded with gluons (i.e. particles transferring strong nuclear interactions). The process of combining quarks/antiquarks into complexes is called hadronization. Unstable hadrons built from quark-antiquark pairs are called mesons. If one of the quarks in a meson is a charm quark, the particle is called a charm meson and is denoted by the letter D (or for the charm antiquark: D with a bar above it). A pair built of a charm quark and a down antiquark is a D+ meson, and one consisting of a charm antiquark and down quark is a D- meson. “ Charm quarks are mainly formed during gluon collisions in so-called hard interactions, and after birth they hadronise into D mesons. 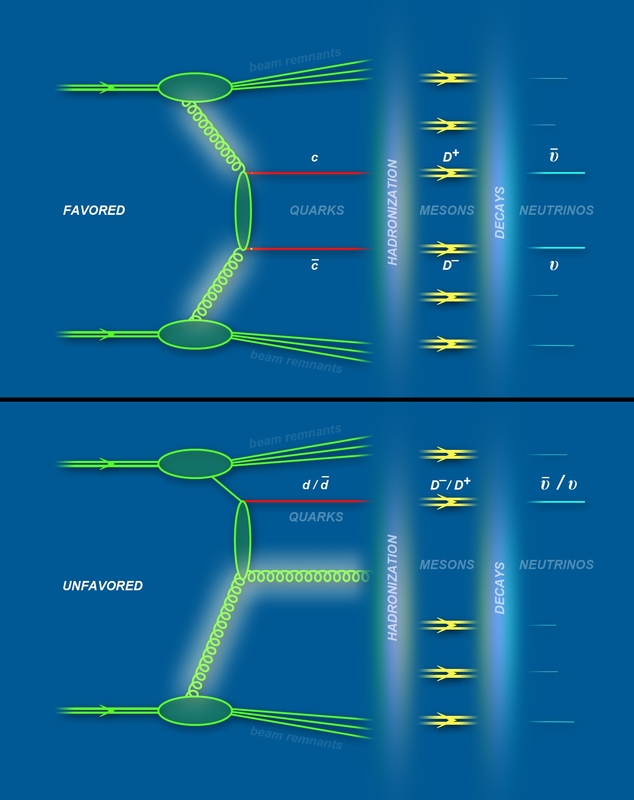 We investigated another meson formation mechanism, known as unfavoured quark fragmentation. Here, the charm meson is created as a result of hadronization of a light (up, down, or strange) quark or antiquark. By means of the nuances of this mechanism, the asymmetry between kaons and antikaons, i.e. K+ and K- mesons, was explained earlier. Until now, however, it has not been investigated whether a similar mechanism could explain the asymmetry between the relatively massive D+ and D- mesons ”, says Dr. Rafał Maciula (IFJ PAN), the first author of the publication in the journal Physical Review D.
The LHCb detector mainly measures particles diverging from the point of collision of protons at large angles to the original direction of movement of these protons. According to the Cracow-based physicists, the asymmetry in the production of D mesons should be much greater if particles produced in a forward direction are taken into account, that is, along the direction of the proton beams. This means that the currently observed disproportion may be just the tip of an iceberg. Calculations suggest that in the case of “forward” collisions, unfavoured fragmentation (d, u, s → D) may be comparable to conventional fragmentation (c → D). As a result, the asymmetry between D+ and D- mesons may reach even a high percentage and also with lower collision energies than those currently occurring in the LHC. The research of the physicists from the IFJ PAN may have far-reaching consequences for neutrino observatories, such as the IceCube Observatory in Antarctica. This detector, in which 49 scientific institutions from 12 countries collaborate, monitors a cubic kilometre of ice, located almost a kilometre below the surface, using thousands of photomultipliers. Photomultipliers track subtle light flashes, initiated by the interaction of ice-forming particles with neutrinos, elementary particles very weakly interacting with ordinary matter. “ When interpreting data from the IceCube detector, the production of neutrinos in the Earth's atmosphere caused by ordinary cosmic radiation, including collisions involving protons, is taken into account. The thing is that some of these processes, resulting in the formation of neutrinos with high energies, take place with the participation of D mesons. Meanwhile, we show that the mechanism of production of these mesons in the atmosphere can be much more efficient than previously thought. So, if our assumptions are confirmed, some of the highly energetic neutrinos registered, now considered to be of cosmic origin, have actually appeared just above our heads and are disturbing the real picture of events in the depths of space ”, explains Prof. Antoni Szczurek (IFJ PAN). “ Fortunately, no other competitive proposal predicts such a clear increase in asymmetry in the production of D mesons at lower collision energies. So, to check our assumptions, it would suffice in the LHC accelerator to direct a single beam onto a stationary target, which would significantly reduce the collision energy. Our model therefore meets the criteria of very reliable science: it not only explains previous observations, but above all it can be rapidly verified. In addition, this can be done very cheaply!” sums up Prof. Szczurek. "D meson production asymmetry, unfavored fragmentation, and consequences for prompt atmospheric neutrino production"